Another question for the South Bend folks. Looking through my 2006 watch guide, the grade 313 watch has two listings - marked and unmarked. The Marked variety commands a premium over the unmarked. 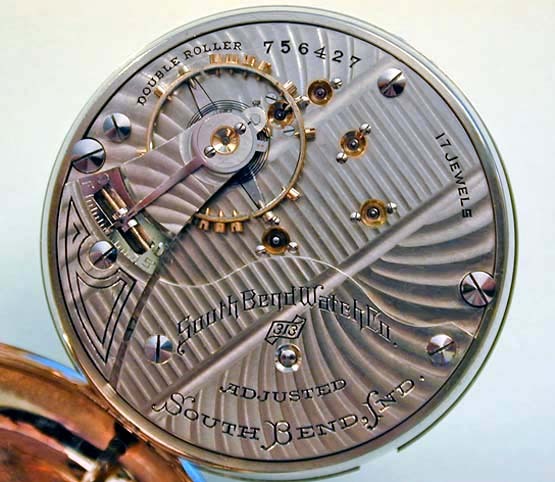 According to the serial # list that is in the watch guide there are 8 Runs of 1000 each -total of 8000 313's produced. Does anyone have an educated guess as to how much less common the marked variety is? I ask because the only 313's I recall seeing have been the marked variety and both of the 313's I own are the marked version. That's a mistake you've come across, see graph to be posted below. Lindell is working on having those listings corrected and he is also in the process of updating the entire South-Bend section. 542014 <<< Image shown below in this topic, MARKED 313, all numbers match. 2nd Run (553001-554000) ALL MARKED "313"
3rd Run (560001-561000) ALL MARKED "313"
4th Run (571001-572000) ALL MARKED "313"
5th Run (601001-602000) ALL MARKED "313"
6th Run (701001-702000) ALL MARKED "313"
7th Run (731001-732000) ALL MARKED "313"
8th Run (756001-757000) ALL MARKED "313"
I thought something was up when I have seen so many marked watches. Thanks for all that is freely shared on the site. Since some of the earlier postings, we re-wrote the South-Bend section of "Complete Guide to Watches" including Grade 313 listings and made some corrections, be sure to do a full review of what you will find in next year's watch guide. A recent topic "18s railroad watches?" got me going on the South-Bend Grade 313 so I updated Frank's post above, turning it and therefore this entire topic into a hopefully comprehensive 313 Database for additional interest. Take a moment to read that topic all the way through. 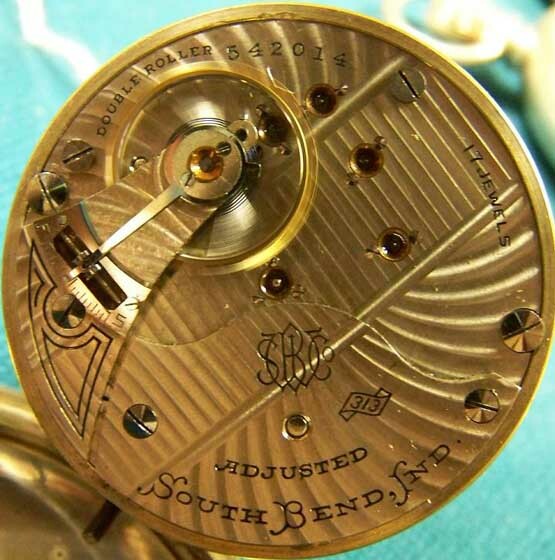 The watch shown below was "Railroad Approved" and carried by my dad on the Bessemer and Lake Erie Railroad, the story of which is linked above and hopefully some of you may find it of interest. Note the attached picture, it is a first run marked 313, so not all of the first run were unmarked. Barrel Cover serial number matches. Please confirm which of those listed in your post above are MARKED 313 and which (IF ANY) are UNMARKED AS TO GRADE as this in important to what will help establish the record on these movements and later this year will lead to our request for watch guide revisions to page 371 of the South-Bend Grade 313 listings and also upgrade most of the others. All of those I listed are marked... Been waiting to find an unmarked for a couple years and have yet to find one. Hopefully one of these days! I've got the following serial nunbers all marked "313"
731797 marked 313 on ebay. I have number 756340. It is marked from run 8. Ok I picked up one from the 6th run, marked with the sn 701381 with a dial that is labeled Pioneer Standard with Roman Numerals. 542014 <<< Image shown above in this topic, MARKED 313, all numbers match. I updated our list with Claude's number and 3 of mine (2 watches are donors, one running).